Home Is Wine a Sin? This is one those cases where the cost clearly outweighs the benefit but I'm going to address it anyways. I believe this question was asked in regards to alcohol consumption in general so I'll address it as such. 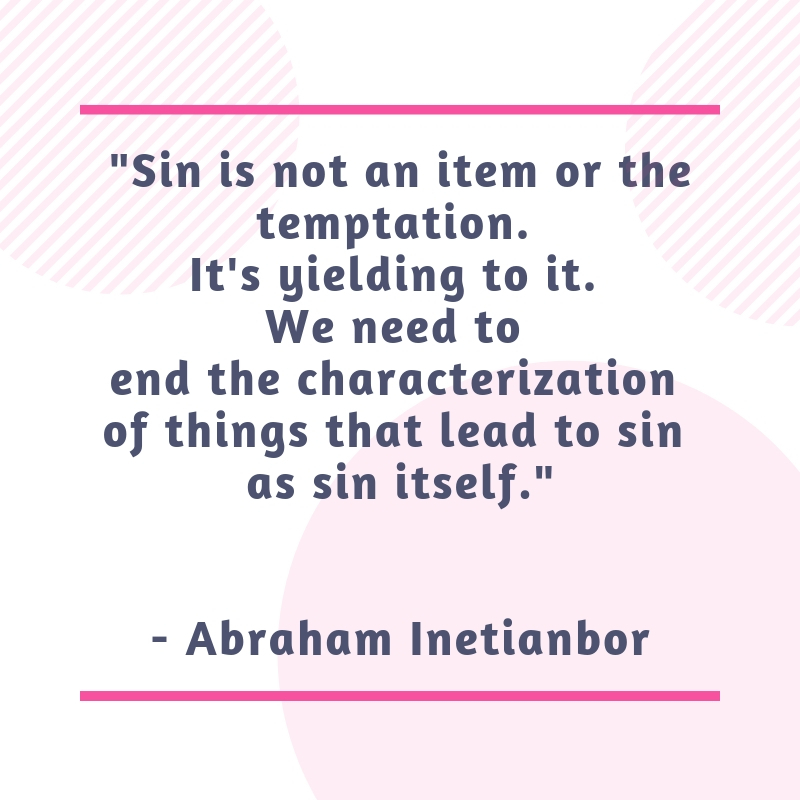 Even though the bible clearly said temptation is not a sin, it also commanded us to "flee" (2 Timothy 2:22-24) and not "yield" (I Corinthians 10:13). For these simple reasons, we do not intentionally go around chasing after temptation to prove how strong we are (I Corinthians 10:12-13). Asking if wine is a sin is like asking if temptation is a sin. However, most people don't see it this way because they believe that you have sinned when touches your tongue. Passively reading the scriptures is like asking the bible to tell us or validate something that we already know. This should not be the way to study. We can all do better. As I often say, the only way to let the bible speak is to stop telling the bible what to say. Break the circle and let God take the glory. You have probably heard John 2:1-12 quoted in defense of why a Christian should drink wine. For this piece, I'll deliberately staying away from this water to wine miracle by Jesus because it has been overly used and debated and a long story. Let me clarify somethings before telling you what I believe the bible says on this topic. Alcohol is in many ways part of our everyday lives. It can be found in one form or another in the food or fruit we eat; it is used by hospitals to prep people for surgery; used by many people to sanitize their dirty hands and contained in cold medicines like NyQuil - the list goes on. 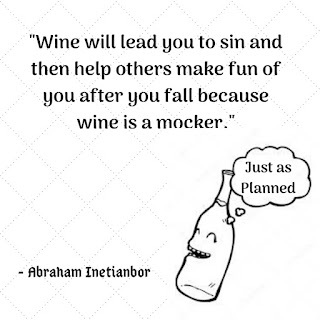 Wine will lead you to sin and then help others make fun of you after you fall because wine is a mocker (Proverbs 20:1). When Paul told Timothy to have a little wine for medicinal purpose to help with his stomach, the inspired message did not just come out of the blue if wine was not readily available to Timothy (1 Timothy 5:23). I know some have argued that this was just for medicinal use only. This argument fall flat because it clearly shows that drinking wine is not a sin. If it is, then you are basically saying that Paul, through the Holy Spirit told Timothy to go and sin just to get better. When a young adult is burning with sexual desire, you don't tell them to go get a one night stand. Your advice will be like Paul when he said through the Holy Spirit - "...it is better to marry than to burn with passion." - 1 Corinthians 7:9. 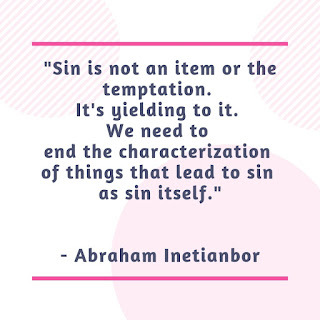 We need to end the characterization of things that lead to sin as sin itself. Some have said people get drunk with a little wine. We can obviously conclude that Paul is not asking Timothy to go get drunk based on his previous statement to Timothy in chapter three when he outlined the qualification of an Elder or Bishop (1 Timothy 3:3). We know that Timothy didn't just have a simple stomach ache because Paul had prior knowledge about it. Also, the time lapse from Paul's letter being written to when it was delivered to Timothy shows that Paul knew that the stomach problem will still be there by the time Timothy gets the letter. Paul himself also acknowledged the frequency of Timothy's other illness that the wine is needed for in the same verse in 1 Timothy 5:23. Yet all we mostly talk about is the stomach. Yes, it could be that the other illness were a result of his stomach problem but this is not the point I'm here to discuss. If this is an ongoing issue, then it is safe to say that nothing else has worked for its treatment, hence the advice to use a little wine. Medicinal purpose or not, the fact remains that he was asked to have a little wine - not Water, Sprite or Pepsi. Paul knew Timothy will understand exactly what he meant so Paul didn't have to say "white" or "red" wine. With their very strong relationship, scriptural references and Paul's mentoring, we can easily conclude that Paul and Timothy have both talked about this wine issue before in the past. I can't tell you if or not they discussed in the past on what kind of wine will get the healing job done but it's obvious that Paul assumed Timothy should know exactly what to do by not going into too much details. Wine is not a sin and drinking wine is NOT a sin either but don't abuse your freedom. Drinking any alcoholic beverage including wine MAY also give the appearance of evil (1 Corinthians 8:8-13; 1 Thessalonians 5:22) or as some will slang it by saying it gives the wrong, twisted or bad vibe to others. Just imagine showing up to a new convert's house smelling like alcohol. Drinking too much wine, being drunk, or allowing drinking of alcoholic beverage to have control over you or your lifestyle is a sin. If you know that there is a line especially knowing how much the devil will love for you to get as close to that line as possible so he wouldn't have to do much work to pull you across; do you really want to test how close you can get to the line or stay away from it as far as you can? 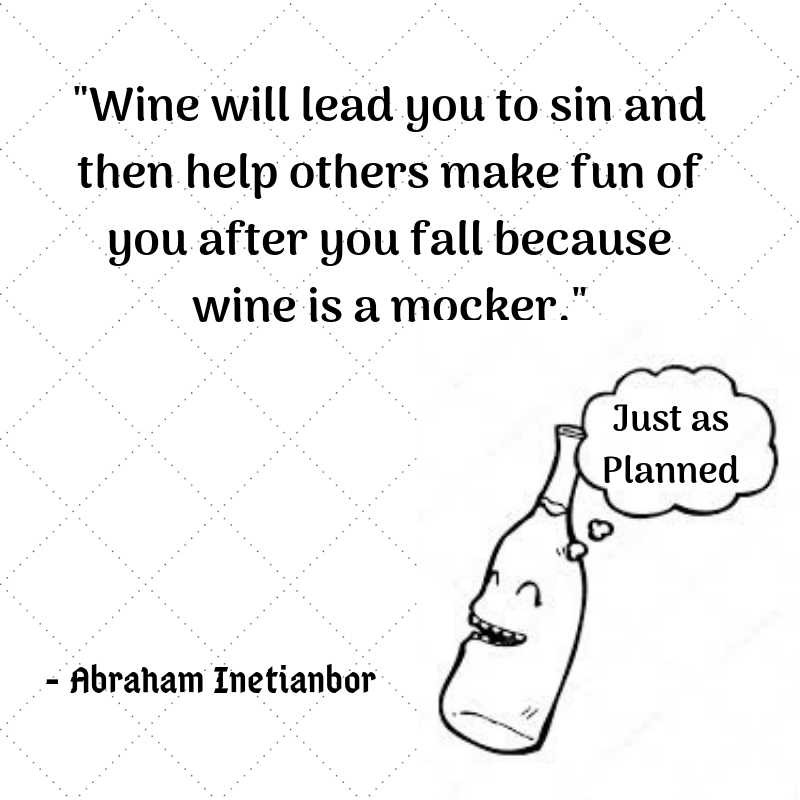 The damage that comes with being an alcoholic cannot be underestimated (Proverbs 23:29-35). It is true that we should avoid anything that will lead us to sin but this is different from flat out calling wine a sin. It's a misuse of the scriptures because money can lead us to sin too. When you prioritize anything in life above God, it automatically becomes your idol. Money is root of all evil so are we now going to avoid touching money? The best way to handle this topic is to tell someone that drinking can lead to drunkenness, which is a sin. So avoid craving or chasing it if you don't want to become a drunk ESPECIALLY if you have no medical need for it. Drinking nothing, nada, zero wine is a guaranteed solution so choose wisely. I made a personal choice to not make alcoholic beverages a necessity in my life but this doesn't mean I haven't tasted it or will not taste it again in the future. My personal choice is to do without and never make it a priority. I highly recommend you do the same but this doesn't mean I now have the right to tell people that "wine is a sin." I cannot make my personal choice into law. There are a lot of factors that influenced my decision to abstain from alcoholic consumption. 1. I'm entitled to CHOOSE just like anyone else. 2. I love being AWARE of my surrounding. 3. My TASTE bud is not tuned into beer taste. Lucky me! 4. My guaranteed way to not get DRUNK is to not consume alcohol. 5. Alcoholic SLURRED speech cannot be understood. 6. I like to be productive and Sobriety is KEY to productivity. 7. I like to DRIVE more than I like to fly. 8. I did not GROW up in a house where alcoholic beverages was prevalent. 9. The health of my LIVER means a lot to me. 10. I'm not going to make the alcohol company richer so they can make more of what could potentially make my life be MISERABLE. As always, I'm open for any healthy biblical debate and all other messages filled with hate and personal attacks/opinions will be nicely referred back to read the entire blog to get a full picture.